Key Messages: Kt/V is a measure of dialysis adequacy (dose) and related to the urea reduction ratio (URR). A QIP measure, the proportion of patients with Kt/V below 1.2 has remained <5% since April 2015. Key Messages: Hemoglobin levels are used to assess anemia. 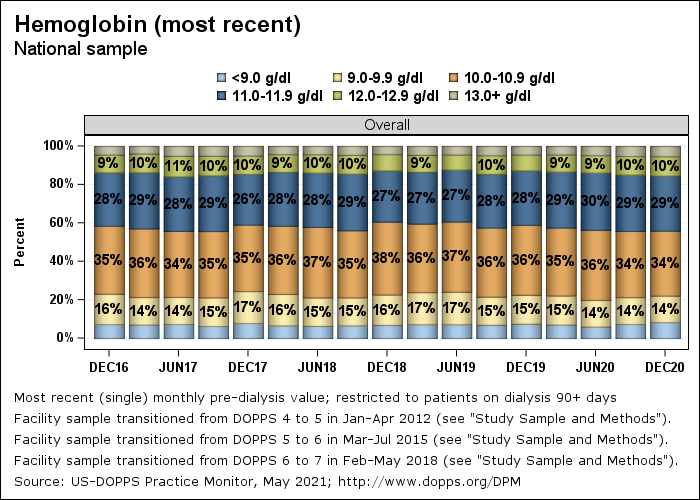 Since December 2014, the percentage of patients with hemoglobin above 12 g/dL has remained 14-15% (down from 31% in August 2010), the percentage with hemoglobin below 10 g/dL has remained at 18-20% (up from 8% in August 2010), and the percentage with hemoglobin below 9 g/dL has slowly increased to 7-8% (up from 3% in August 2010). Key Messages: Mineral and bone disorder (including abnormalities in serum calcium levels) is common in dialysis patients. Total calcium levels can be impacted by use of certain medications and dialysis therapies. 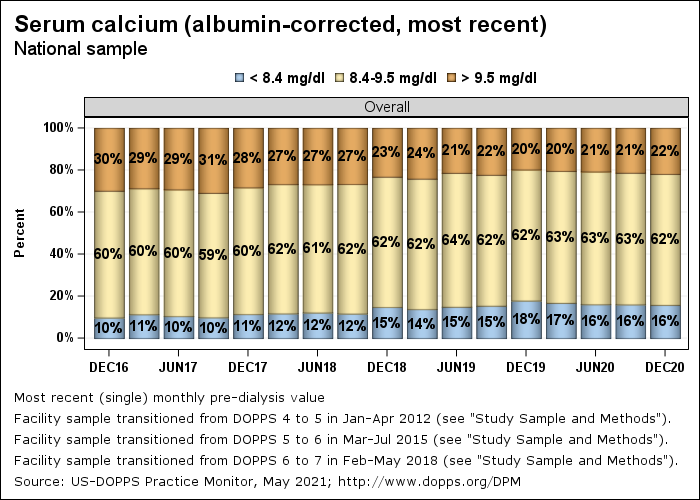 No clear changes have been seen in serum calcium values during the DPM study period. Key Messages: Mineral and bone disorder (including abnormalities in serum phosphorus levels) is common in dialysis patients. Various factors are associated with serum phosphorus levels including nutritional intake, phosphate binder use, and serum PTH levels. 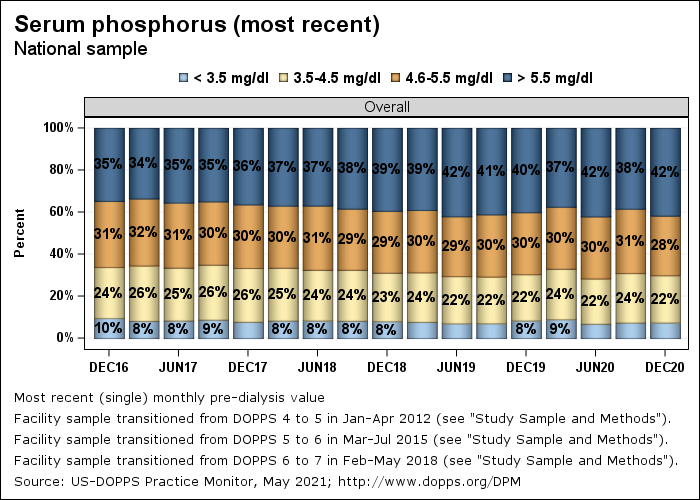 No clear changes have been seen in serum phosphorus values during the DPM study period. Key Messages: Mineral and bone disorder (including high levels of parathyroid hormone [PTH] in the blood) is common in dialysis patients. Injectable vitamin D and several oral medications are commonly used to lower PTH levels. Since December 2014, PTH levels have risen. 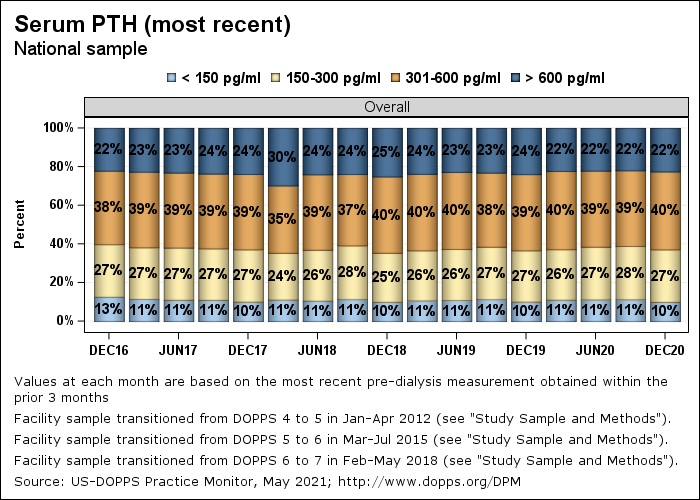 The proportion of patients with PTH 150-600 pg/ml has decreased from 69% to 65%, and the proportion with PTH above 600 pg/ml has increased from 21% to 24%. The mean PTH in February 2018 was 499 pg/ml, and the median PTH value was 364 pg/ml. Key Messages: Clinical guidelines recommend maintaining serum potassium levels in the normal range, between 3.5 mEq/l and either 5.5 or 6.0 mEq/l. 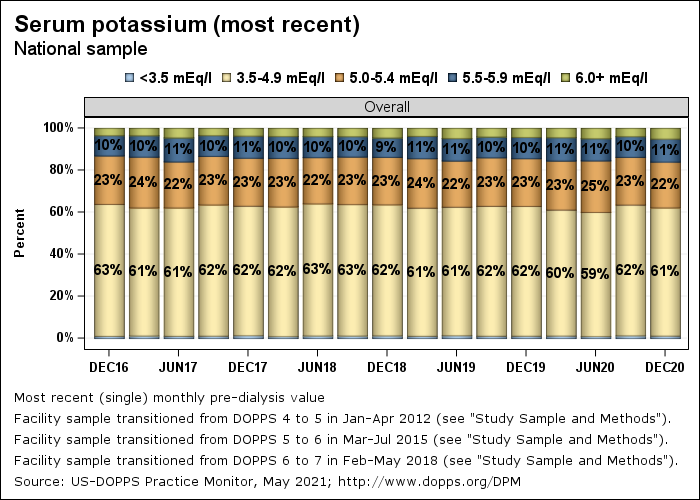 In February 2018, 85% of patients had potassium levels between 3.5 and 5.5 mEql, and 95% had levels between 3.5 and 6.0 mEq/l. 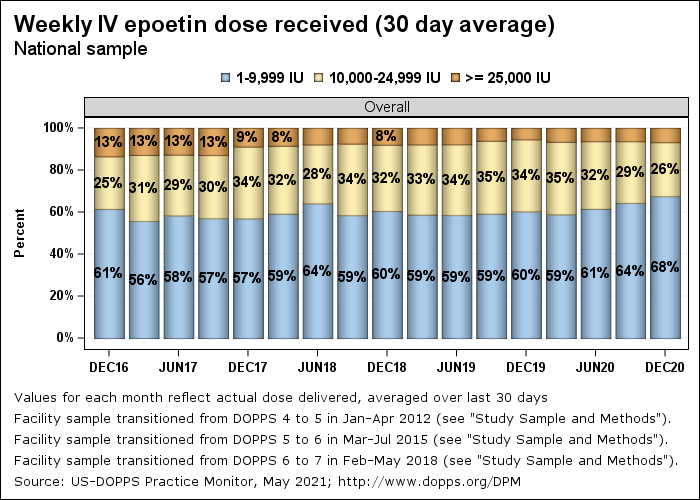 Key Messages: Since December 2014, the distribution of delivered IV epoetin dose has increased slightly, with 43% of patients receiving doses above 10,000 units/week. In February 2018, the mean delivered IV epoetin dose was 11,900 units/week (down 40% from 19,900 units/week in August 2010) and the median was 9,100 units/week (down 33% from 13,700 units/week in August 2010). 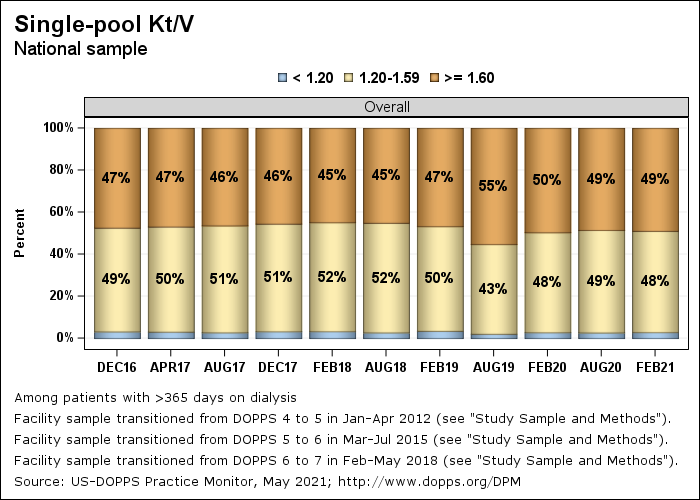 The average weekly IV epoetin dose received is calculated based upon the actual amount administered to patients during a 30 day period prior, on average, to the mid-point of each month. Prescribed versus received epoetin doses may differ for various reasons including withholding or reducing the prescribed epoetin dose for a period of time. Key Messages: The percentage of patients prescribed IV iron at any time during the study month increased slightly from 66% in December 2014 to 79% in September 2016, but has recently declined to 68% as of December 2017. Key Messages: Mineral and bone disorder (including abnormalities in serum PTH, calcium, and phosphorus levels) is common in dialysis patients. Injectable vitamin D medications are used to lower PTH levels. The percentage of patients prescribed IV vitamin D has steadily declined from 68% in December 2014 to 51% in December 2017. A concurrent rise in the use of oral vitamin D medications has also been observed. Key Messages: Cinacalcet is an oral calcimimetic medication used to lower PTH levels in patients who have high PTH levels. Since December 2014, the proportion of patients with cinacalcet prescription has gradually increased from 27% to 30% in December 2017.